Vindoos Garden, Whitefield | ITPL Bangalore. Our first of its kind food truck in Bangalore is equipped with an enriched menu. Grabbing a cup of tea and hanging out with buddies over hot pakoras is always a good idea and we at Vindoos is ready to reboot your evenings through our food and other refreshments. Park by Vindoos and grab a bite full of nostalgic cravings and thirst because watery mouths always deserves ‘the special’. Our mega kitchen is equipped with an enriched menu of south Indian vegetarian and non vegetarian dishes in different sections. We ensure handpicked organic vegetables and best quality ingredients are assembled to blend them with perfect seasoning in hygienic environment and bring authentic menu to your platter specially missed by the techies far from their home. Ours secret of taste and success lies with our honesty and dignity to serve you the best and highly nutritious food at your doorstep and we retain it with care. Vindoos recipes are available for catering services at your doorstep. Just give us a call so that we can enrich your hangouts with authentic South Indian veg as well as non-veg varieties. 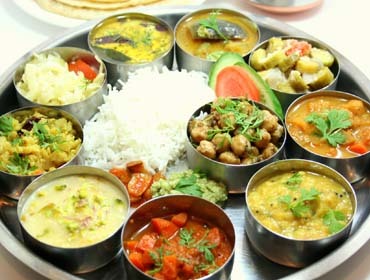 Excuisite South Indian dishes in one single platter is our exclusiveness with rasam and sweet dish as an extravagance. Flattened rice, commonly known as chira, is rice which is flattened into flat, light, dry flakes originating from the Indian subcontinent. Stopover at Vindoos and enjoy the most sizzling, hot and spicy chicken biryani. It soothes your soul from within and keeps you full for long. Tawa rotis or phulkas is quite healthy and tummy filling food to have along with delicious curries made with all nutritious components. 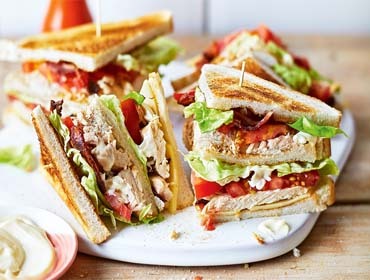 sandwich is vegetarian sandwich consisting of various vegetables which may include mushrooms and cheese. Creativity in design and exceptionally delightful in recipes, our menu steals your attention with aesthetics and tastes. We are fulfilling the soul of our customers with exceptional flavourings minted throughout its elegant menu. Watch our for our taste and we are sure that it would be irresistible for you to stop by us. Healthy and tasty fluffy idlis are our speciality. Prefer these Idly as one of the best options to fill the tummy which soothes your soul too. Very tasty south Indian doughnut with crispy and fluffy texture makes us class apart. Dipped in sambhar and chutney this vada gives mouth watery feeling. The South Indian delight which gives you addiction is something we make in the name of dosa. Order these dosas and enjoy 99 flavors of it. Being a perfect combination of rice and vegetables it's a complete food in itself with high nutrient content and served with curd makes it more delightful. Highly preferable exquisite breakfast dish is great to have. It fills your tummy and appeases your soul & keeps you full for a longer period. Expertised rice bath chefs with aromatic flavors and spices in it. Complete food in itself served hot hand in hand. Explore our 35 rice bath recipes. Ecstatic desert!! It's a juicy and savory dish which melts in mouth immediately as we eat. Made from rava, sugar and dry fruits its just flavorsome. Enjoy the most crunchy and crisp puri dipped in tangy and spicy alu curry at Vindoos & relive the most happiest moments of life. Munch on the most fluffiest and soft paddus served at vindoos with tangy & spicy chutneys and chutney powders and appease your soul from within. 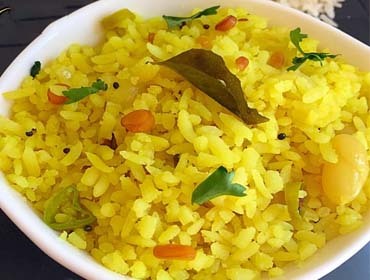 Cook the dal and rice together with turmeric powder in a pressure cooker until mushy. It fills your tummy and appeases your soul. 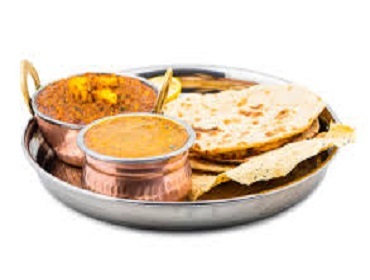 Excuisite South Indian dishes in one single platter is our exclusiveness with rasam and sweet dish as an extravagance and add flavors to the plate. Appetizing curries with aromatic spices reflects India's vibrant flavors and essence. Get these flavors at its best place and enjoy the delicious and tempting food. Tawa rotis or phulkas is quite healthy and tummy filling food to have along with delicious curries made with all nutritious components stored inside it. 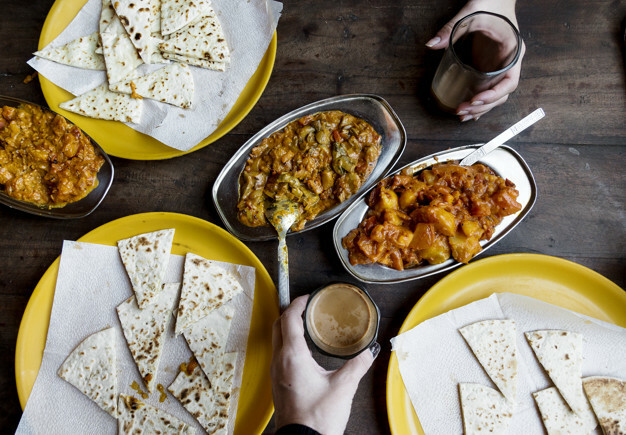 Flat breads made on tawa with ghee is quite healthy to have along with a delicious curry made with all the nutritious components stored inside it. Extremely luscious Indian bread with spicy mashed potato stuffed inside it is one of the best food to have. Curd and curries as addons are great combos. Delicious and spicy once at a time describes veg biryani to its best. Having all vegetables nutrients along with rice and when served hot increases once appetite. Chitrana as its another name is a daily food in south India and is loved by all. It tastes great with a pinch of tanginess in it. 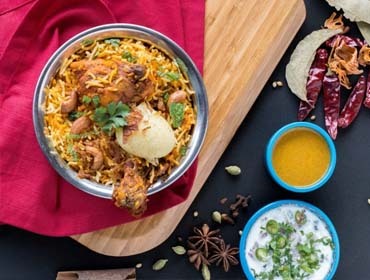 Stopover at Vindoos and enjoy the most sizzling, hot and spicy chicken biryani. It soothes your soul from within. An exquisite north Indian snack famous all over India doesn't need introduction. Highly demanded throughout the year it is enjoyed more in winters and rainy seasons. Deep fried mirchi bajji with a tangy taste is prepared and can be ate with almost everything. Its a versatile dish and prepared with less spicy chilies. 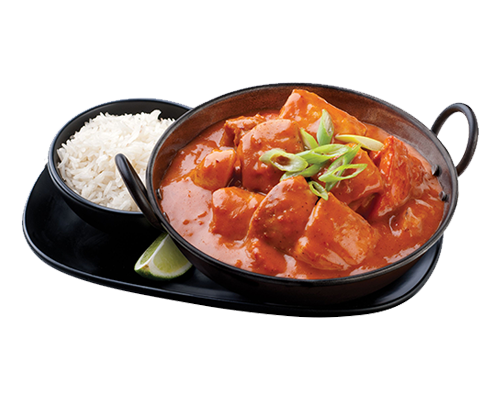 A Chinese dish made with Indian flavor tastes spicy and tasty simultaneously. This dish can be combined with roti, chapati and even some rice recipes. Hot and peppery dish made with onion slices is best to enjoy with your friends. Most munched on items is evergreen throughout the year. Light and fluffy aloo bonda is both spicy and savory to munch upon. Enjoy them with tea to soothe your tummy with its yummy taste. The Chinese dish in Indian style is the perfect starter item to have with chapati or fried rice and gives the crunchiness of baby corn with sweetness. Softness of panner with crunchiness of capsicum and onions is a perfect dine out item. Enjoy it at Vindoos restaurants and complete your dine experience. Tantalizing, delicious, luscious etc is less for describing Sandwich and vindoos serves the best of them. Enjoy and eat more Sandwich as much as you can. Very nice flavored thick milk shakes with pomegranate is mouth watery and delightful. Made from pure cow milk it works as a power booster. Sugar free musky flavored chiku-milkshake is a rich source of vitamins and minerals. Served chilled with skimmed cow milk makes it more healthy and preferable. Refreshing milkshake served cold is the best beverage to kickstart your day and also soothes you from within. Despite keeping your tummy full it is healthy too. 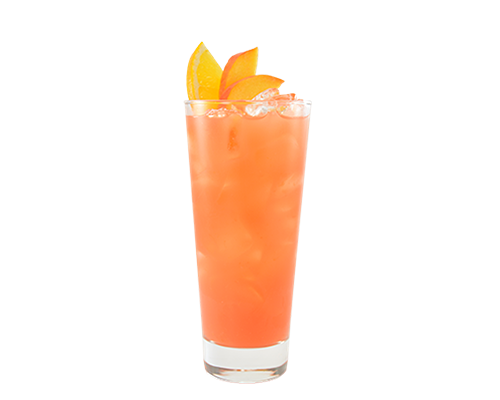 It is one of the most demanded menu item at vindoos made with low fat milk and acts as a healthy heart beverage and also aids in weight loss regimes. Enjoy the mesmerizing taste of strawberry which itself being an exquisite fruit and when mixed with milk and other tangy syrups the shake becomes very special. Enjoy a tempting and mouth watery butterscotch milkshake at vindoos made with butterscotch sauce and ice creams which make your day delightful. Skimmed cow milk shake with a flavor of vanilla in it is a perfect combination to have and when served chilling cold it gives a completely different taste. Kiwi itself is an exquisite fruit full of nutrients and when blended in the form of milkshake it is very ecstatic and delicious to have at vindoos. Aroma of tea leaves along with ginger and elaichi infused in it makes the most delicious tea and is served hot and fresh at Vindoos. Hot and cold coffee is the most relaxing drink made with perfect aroma and on demand sugar content, without adding any additives is served in vindoos. Excellent desert with a perfect combination of milk, sugar, dry fruits specially almonds and nutmeg. Despite being healthy it is also an exquisite drink. Vindoos believes that strength empowers all and so we serve plain cow milk for our customers which can also be the best option for serving your kids. Nine nutrients of horlicks gives you support and strength and we serve Horlicks in hot and pure cow milk to keep you healthy and strong. Highly suggested drink with a combination of 26 vitamins and minerals along with proteins and fiber is served by vindoos fresh and hot. Served in both hot and cold milk it is one of the best drinks to have. Its chocolaty taste is loved by all despite being healthy. Vindoos serves all varieties and flavors of green tea with & without honey prepared fresh and hot. Our core area of service is at Whitefield but we are just a call away and we also extend our services throughout Bangalore as per our customers requirements. We aspire to be the best food provider by walking hand in hand with you. Copyright © Puja N Pujari 2019. All Rights Reserved.